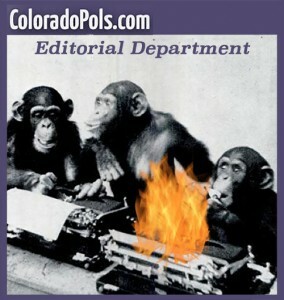 Welcome back to the “Editorial Department” here at Colorado Pols, where we discuss certain opinion pieces, blog entries, and other assorted Op-Ed commentary. Today, we bring you a draft editorial that may or may not have been forwarded to us from the office of Senator Cory Gardner. This is a timely piece that addresses the use of extreme rhetoric in Republican politics. We owe you an apology, America. It has become apparent that some people are actually listening to the words that come out of our mouths, and for that, we sincerely apologize. We are very sorry if you were paying attention to anything we said. We never intended for you to take us seriously. We have heard the calls from people asking that we take a step back and refrain from using inflammatory rhetoric and repeating known falsehoods. The man who allegedly killed three people at a Planned Parenthood facility in Colorado Springs used the phrase “no more baby parts” when being interviewed later by law enforcement officials; this is similar language to the rhetoric that Republicans have used for months in order to demonize Planned Parenthood for providing abortions and other health services to women throughout the country. Is it irresponsible for Republicans to repeat things that we know are untrue? That’s a fair question to ask, and that’s why we are so supportive of legislation that would decimate Obamacare and Medicaid, while also cutting off federal funding for Planned Parenthood. The best way to prevent another violent attack on Planned Parenthood is to just get rid of Planned Parenthood altogether. Also, we must not allow Syrian refugees to enter the United States. In fact, this is all just a big misunderstanding. When Republicans say outlandish things, we are trying to make sure that Republican voters will continue to support us in the next election. When Republicans accuse Planned Parenthood of selling “baby parts,” we are trying to generate headlines, not discussion. I find it more than a little hypocritical that the same people who accuse Republicans of being unable to govern are worried that we might actually be able enact some sort of legislation that would harm Planned Parenthood. The First Amendment of the United States Constitution guarantees us the right to free speech – not “true” speech or even “sort-of accurate” speech. Truth be told, Coffman once backed some obscure measure that Planned Parenthood also supported. He never claimed that the organization endorsed his campaign — he just flashed the logo on the screen. Was it dishonest? That’s not for me to say, but who among us hasn’t stretched the truth on occasion? Shoot, I sometimes tell people that I’m 5-foot-8! I think about that saying every time I hear a Republican start to talk about politics. You should, too. Senator Cory Gardner (R-Yuma) was elected to the U.S. Senate in 2014 after serving two terms in the U.S. House of Representatives. He has a very nice smile. Congress Moves to Sabotage the Paris Climate Summit (of course they did) It will probably turn out to be as big a deal as your 'poison pen' letter to Iranian leaders? In case you missed it, Senator Gardner's vote signaled a middle-finger to all Coloradans who have worked so hard to create the New Energy Economy in our state. It's with a bin-full of irony that his previous Congressional District has been the near-sole beneficiary of the billions invested in rural Colorado to meet the state's 30% clean energy mandate.